The mission of Jean Ballet School is to unify a variety of different forms of dance. Students learn how to express their ideas through dance. We focus on our interaction with the local community- students of Jean Ballet School actively engage in performances throughout the city of Los Angeles to promote dance and community service. 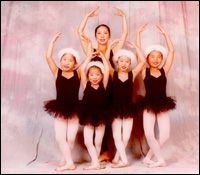 We offer classes in acrobatics, ballet, hip hop, jazz, modern dance, and tap dance.